For the Second Drubwang Pema Norbu of Palyul Monastery, see here. Palchen Düpa (Tib. དཔལ་ཆེན་འདུས་པ་, Wyl. 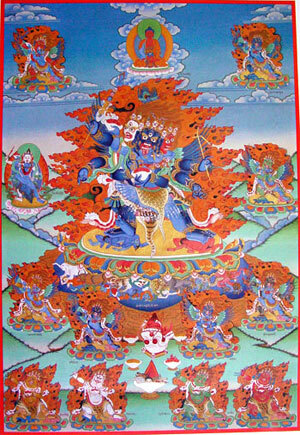 dpal chen 'dus pa) - the blue wrathful yidam practice from the Longchen Nyingtik cycle. It is a practice of Kagyé related to the Kagyé Rigdzin Yongdü revealed by Ngari Panchen Pema Wangyal. Khenpo Ngawang Palzang, A Guide to the Great Glorious Assembly (dpal chen 'dus pa'i zin bris) (Collected Works, vol. 1, pp. 173-174). This page was last edited on 29 October 2018, at 09:43.